Inclusion, or placing different ability levels together in the classrooms, has been a proven practice in education for years. Research has shown that this mixture has been good for everyone, including those with and without disabilities. The National Center for Education Statistics reports that 13 percent of public school students in the U.S. have a documented disability. Autism, intellectual disabilities, developmental delays and emotional disturbances account for 5 to 9 percent of students in special education. This is a vast mass, and even with specific training, many teachers do not always feel fully equipped to serve these students well. Church leaders are noticing that similar numbers of followers have disabilities, so this trend is emerging in the faith community as well. Although church leaders seek to be as welcoming and as inclusive as possible, people with disabilities don’t always find the support they want and need to engage deeply in this community. People with intellectual disabilities in schools and churches at times need an advocate to help engage them and address the challenges they face in school and faith environments. The problem is that in both cases, the people who want to serve these populations don’t always get the kind of one-on-one experience that would help them prepare for this important work. One model that has been changing this preparation in a radical way is The Friendship House. The Friendship House is a small residence dorm in Holland, Michigan, where individuals with intellectual disabilities live side-by-side with similarly aged non-disabled students attending either Western Seminary or Hope College. This dorm consists of pods where three non-disabled people and one person with a disability live together as roommates. Each of them has their own room and share common areas like a kitchen, laundry room, deck and TV room. By living here, the seminarians learn to be better equipped personally and professionally to serve these people with disabilities and their families as a future pastor. In a similar way, Hope College students, studying special education, psychology, or social work, use this hands-on experience to help prepare them for this future professional skill. Through interviews with the non-disabled residents, my research has found that not only is this living model effective in preparing people for their future careers, but it also has immense personal benefits for both disabled and non-disabled residents. Through this qualitative research after the first year of the program, it was revealed that the non-disabled participants in this dorm felt immense joy in watching their roommates with an intellectual disability, whom they call “Friends,” improve their social skills, develop confidence and become more independent as they bonded throughout the year. The experience provided important benefits for the “Friends,” too. They had been living with their families until they moved into this dorm and often their parents had performed simple tasks for them that, at times, they were capable of doing themselves. Since the “Friends” now had to negotiate life on their own, their independence and self-determination skills began to blossom in this new environment. This included how to appropriately talk to their roommates, how to be considerate when living with busy university students, and how to find their own fun and entertainment in the community setting. To live at the Friendship House, the “Friends” had to obtain either part-time or full-time jobs, find their own transportation to those jobs, and learn how to manage their own money, thus helping them develop important life skills. There were, of course, challenges to this type of living. 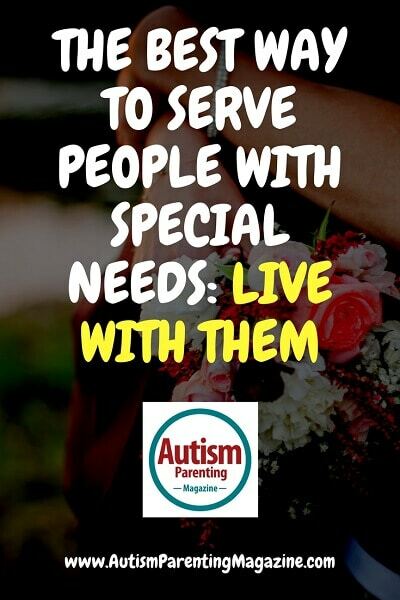 The non-disabled roommates sometimes ran into trouble balancing the roles of friend with the role of supervisor, but navigating that balance was essential for enabling the roommates with intellectual disabilities grow in their self-determination skills. Despite the challenges, the majority of university students interviewed responded they would recommend this type of living arrangement to others who want to gain a better understanding of people with intellectual disabilities and their families, as well as grow personally and professionally for their future careers. The non-disabled roommates began to understand that these “Friends” were similar to them and experienced some of the same frustrations and joys that they did. This living situation made the non-disabled roommates realize that it is sometimes necessary to break down perceived ideas and barriers and ask questions in order to get to know a person—a lesson that is perhaps the most valuable of all in any walk of life. *Jane Finn is a professor of education at Hope College in Holland, Mich.
Jane E. Finn, EdD, is a professor of Education at Hope College in Holland, Michigan. She is recognized for her research in independent living for people with exceptionalities as well as transition practices for youth with disabilities. Dr. Finn has a background in education, administration, counseling, and special education. She has worked over 25 years in the field of education as a high school teacher, special education instructor, counselor, and professor.